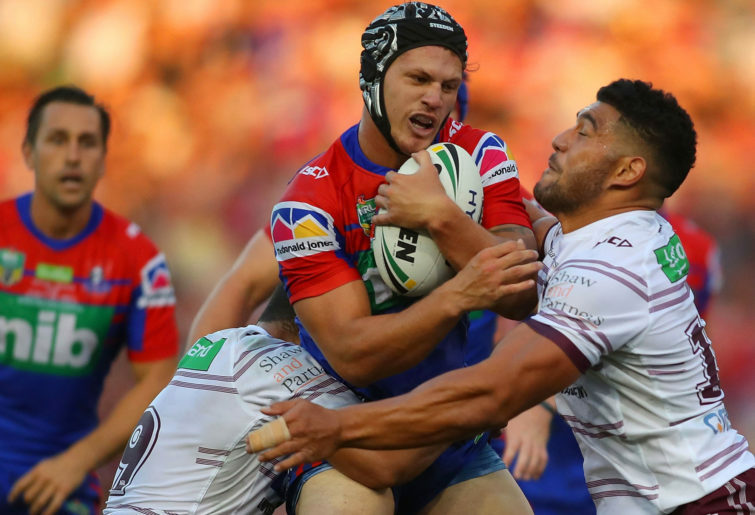 Kalyn Ponga is set to eclipse his debut season, with the young Knight to single-handedly deliver Newcastle premierships and air-conditioned classrooms by year’s end. That’s the opinion of frothing media outlets and manic fanboys, who have vowed to treat Ponga with a no-fault policy he can live up to their unattainable criteria yesterday. Uber-gushing for the boom rookie is already on track to inundate 2018′ s record inundate of deifications, despite imminent threats to his career like second-year syndrome and being a male in his twenties. This find Ponga’s picture hanging everywhere in rugby league like a red-haired dynamo who’s been reluctantly installed as president-elect of a communist state, much like when Paul Vautin rose to power in Queensland in 1995. Not even his switching closer to the unwashed mortals in the defensive line at five-eighth is enough to stalling sensationalist adherents from expecting him to continue dissecting defences and the Red Sea- and rightly so. Just because he has minimal experience in the roles of playmaker and messiah, and that he is barely off his P-plates, Ponga is undoubtedly the Second Coming. In fact, I have joined hype merchants in booking the Origin rep for an additional 15+ years of flawless immortalism following his 2019 Dally M/ Clive Churchill/ Nobel Prize treble, because no footballer ever makes a crippling gaffe in their formative years. And even if Ponga did, it’s not like the game would destroy him, or even chase him into a car park with a camera. Claims he should be afforded time to develop and that he is only a kid are despicably tempered and sensible and should be punishable with 28 hours exposure to moderate commentary from a public broadcaster. For those unaware, Ponga is a fresh-faced kid that bestowed untold enjoyment on rugby league fans in his debut season, predominating at fullback for the Knights with a sense of liberty merely felt by those lucky enough to have pee-pee in a chest-deep water reserve. The W-Aborn product separated himself from his peers with a fabulous season, proving himself as a rare tangible talent in an epoch when players are selected on ethereal qualities like character, resilience and the ability to not assault others. Making his starring even more irresistible, Ponga can speak. He is an articulate chap, who unlike a number of footballers his age can make more repartee than a purse of ham. No wonder he has been elevated to rugby league’s Jesus status. It is a fitting title, even though the comparison is a gross underestimation as the Son of God never qualified for four rep teams across two codes. So as thanks for Ponga’s twinkling feet and tremendous thrills, we, the game, will return the gift with point-blank expectation and Mark Gasnier hyperbole. Then we will prematurely eviscerate his career when he publicly farts. Again, conservative kinds will recommend us baying lunatics to pump the brakes, and maybe even consider a Benzo- both the tranquiliser and Barba. That’s because we know what happened to lauded kids like the sacked Cowboy, Tim Smith, Chris Sandow and the other 15 future Sonny-Bills now playing club rugby. But we will not yield. Judging from trial matches and back pages, it seems 2019 will be more of the same; a pile-on of commentators desperate for a spare pocket not infiltrated with hot air, all lauding Ponga for moves made by other players, sometimes not even on the same squad. This is why Ponga will immediately deliver on our unreasonable demands at five-eighth, and revise history as the man who inspired Darren Lockyer to stimulate the switching from fullback. Why not? The kid has played 28 games elsewhere, and one Origin in the back-row- albeit only against New South Wales- so there’s no reason it won’t happen by the end of next round. It’s not like he has to fulfil the expectation at a club under intense pressure to make finals, one that burdens its halves with the shadow of one of its all-time great playmakers, Sean Rudder.